This sign has appeared in the parking lot where Moses Tucker tried to build an Aloft Hotel on Clinton Avenue. I saw a news story the other night on TV and it said construction would begin when a lease is signed for the project. Looks amazing. I wonder what all it will contain? Will be a heck of a lot better than the parking lot the city wanted to put there. I think this end result was ideal, with a retail/mixed use project on Clinton Avenue and the aLoft one block south - stretching development to other blocks (I think this will end up being a great thing). Regarding the Arcade, I like the idea of a movie theater...I hope it pans out, but I know the theater at Peabody Place in downtown Memphis has struggled (if it's still open). I think the problem with the Peabody Place theater was it started off with too many screens(20). On top of that there are not a lot of people that live near the theater. 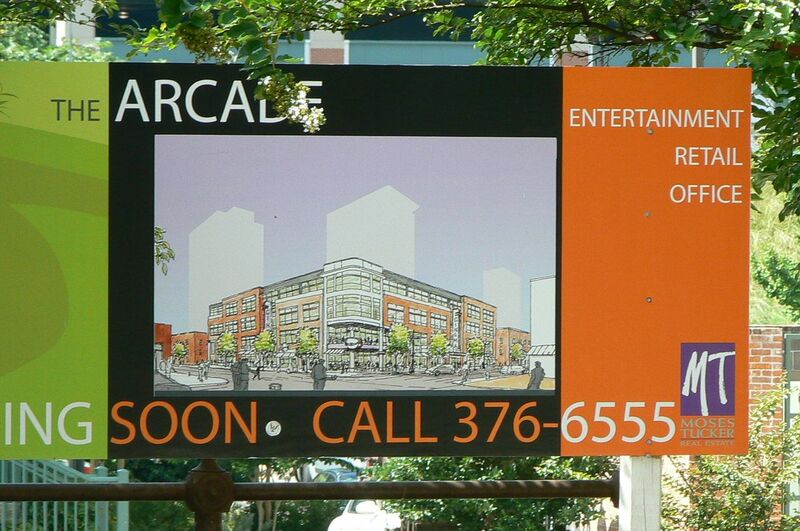 A theater in the River Market would draw from the Heights, Riverdale, Midtown and sections of North Little Rock. Peabody Place's Muvico 22 closed in late 2007, I believe. It did seem an ambitious amount of screens, even for a tourism-driven city like Memphis, in the downtown area. It's doubtful that The Arcade would incorporate that big of a movie theater, which I agree would pull customers from several areas including Riverdale. It would likely be at the expense of the Riverdale 10 (should it still be operating by then), currently set in a center where fortunes look less than bright at the moment. There might have been just too many movie theaters for Memphis to support. That's where Malco has it's offices and at least a couple of their 'flagship' theaters. At one time Malco was mainly an Arkansas based movie theater company. Although their main focus seems to Memphis they still have a number of theaters in Arkansas. They've been very aggressive in NWA. There's only two theaters in NWA that's not owned by them, one in Fayetteville and one in Bella Vista. But anyway I think another company could have a hard time going up against them in Memphis. I went to a movie there on a weekday evening in Spring 2007, and I swear, we must have been the only people in it. No lie. It was eerie...the place was huge. It must have been bleeding cash. is there a website yet? I haven't seen anything in the news about this yet. A better picture of the sign. any news on this? has the economy pretty much killed it? Perhaps this development, but HOPEFULLY not the relocated Aloft hotel...though it was intentionally delayed. Is this at all still a possibility? Because the sign is still there. I still love the idea of this project. I think it would be great for downtown! I've heard (solid) rumors of an impending mixed-use mid-rise. I've been assuming it's this project. I hope so. I really like Moses Tucker as a developer and think they're most likely to be the spark that helps get the momentum of the River Market revitalization to spread more effectively outside of the President Clinton/Markham corridor. 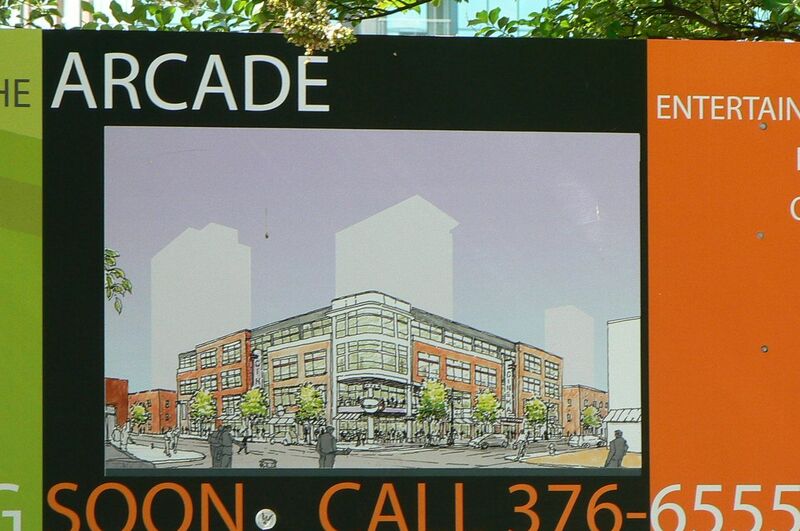 They're the ones that put it on the line for the River Market, so hopefully other developers will follow their cue and jump in on Main Street and nearby projects if The Arcade becomes a reality. What do you consider to be a mid-rise building? I have not been able to find a clear definition for mid-rise. Some claim a mid-rise starts at 7 or 8 floors and at 4 this would not be one? Four floors is just shy of what I'd consider a mid-rise. However, I don't think the term was used definitively to me. I have it on good authority that both the Arcade building and the hotel are still very much alive. The hotel is hoped to be underway by the end of this year with the Arcade building hopefully starting at the same time or shortly after. I've heard - from separate sources - that a mid-rise, mixed-use building is moving ahead. Glad to hear about the hotel as well. I'm assuming you're referring to the aLoft? I assume so. I specifically brought up aLoft and was told the hotel is moving ahead (hopefully later this year) without any correction on the name, so it seems that is still the plan. It sounds like it is more of a short-term likelihood for the hotel to get underway than the Arcade actually (the hotel was mentioned as hopefully later this year and "maybe the Arcade too"), but I do know it's being actively worked on. I would certainly assume that this is the same mid-rise mixed use building you have heard about too, and it would seem likely finances/pre-leasing interest are what they would need to be working on to get the project moving along. WHAT?!!!! Major disappointment (if this is true). So an aLoft works in a suburban strip area of Rogers, but not in a hip, urban downtown are of Little Rock? Wow. Does anyone know about the status of this project or another four story project that will include 15,000 sq.ft. of retail and the remainder residential? It's still alive as previously mentioned, I was told a while back that there should be some news/announcement by the end of the year. I haven't heard anything to indicate there had been any change of plans, anyway.